Get on the same money page with your spouse! Most couples, at some point in their relationships, will experience disagreements and possible resentments over money. While the conventional wisdom has always been that having a budget and sticking to it will solve the financial problems in a marriage, this isn't always the case. 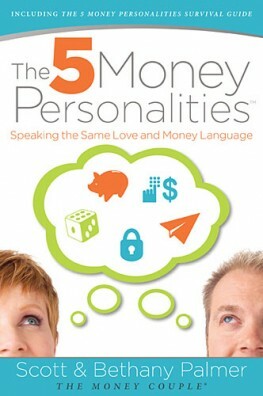 The book The 5 Money Personalities: Speaking the Same Love and Money Language by Scott & Bethany Palmer instead focuses on the different beliefs and attitudes about money that each partner brings into the marriage. Until you and your partner understand your own unique Money Personalities, it is unlikely that any money disagreements can be solved. While nearly everyone is familiar with the statistic that 50% of all marriages end in divorce, I was surprised to find that among couples who do end up going through a divorce, 70% of them blame money issues for the failure of their marriages. The authors of this book, who work in financial planning, recount their experiences in working out detailed financial plans for their clients, only to have the clients come in at a later date and announce their separation over some financial aspect of their lives. This gave them the unique insight that budgets and financial plans will not solve money problems unless each person realizes and takes responsibility for his or her own Money Personality. The five Money Personalities are: Saver, Spender, Risk Taker, Security Seeker and Flyer. Not only that, but most people are a combination of several of these personalities. Talk about being challenging in coming to a financial consensus! There are examples of each category given in the book to help you work out your primary and secondary type. Additionally, there are negative aspects of each type given to show how the resulting behavior might impact your spouse. If you're still unsure, you can take an online quiz to determine your Money Personality. I enjoyed the insights that were pointed out in this book. For instance, many small decisions you make during the day can have a negative impact on your relationship. If you and your spouse are trying to save money, but one has a Starbucks habit or leaves the cap off the toothpaste so that it dries out and half the tube has to be thrown away, that can enrage the other partner who may feel it is unfair that he or she is putting more effort into following the plan. "Make it Happen" suggestions at the end of the chapters to help you more fully explore your attitudes toward money. There are also suggestions on how to negotiate and "fight fair" if you happen to be married to someone with a different attitude to money than you have. Disclaimer: I received a copy of this book from BookSneeze for the purpose of writing this review.